I always like a place with a bit of history. Shining marble, or slabs of steel and concrete do not excite me much. I prefer old things, coloured with the patina of time, the cracks and scars telling their stories. With our current house, it seems I got a bit more than I bargained for. The so-called 'Black and White' houses of Singapore, in one which we live, were build in colonial times by the British government. I had heard rumours that, emptied of their white inhabitants, they were used in World War II to house Prisoners of War. But I did not know the details. One day, felled with flu, I lay in my bed, reading a novel about a lady interned in a Japanese camp in Sumatra. My flustered mind started reeling, imagining myself lying just here, in that same spot, on a much less comfortable bed - on the floor even- struck by malaria, the Japanese on duty marching past the window. A European ‘expat wife’ like myself, in those days, would have been the enemy of Japan, and therefore, would have to be locked up. A few days later, with a much clearer mind, I remembered my feverish dream. The thought of it would not leave me alone, and I planned to find out the truth about my house. Were women like me really imprisoned here during the war? I had read that civilians had been send to Changi prison, completely on the other side of the island. My search for the history of the house led me to Jon Cooper, a British historian who works for the Changi Museum in Singapore. He has been doing a lot of work on the Adam area, first by investigating the battle of Adam Park, just across the motorway. And more recently, Jon and his team have started exploring our own little drive. Emails and phone calls were exchanged, and one evening last week Jon came by to share the history of Adam Drive with all our neighbours. The reason I had not been able to find out more myself, was that the name of the street had been changed. During the war, this area was known as the ‘Sime Road Camp’. The led up to the war in Singapore was chaotic. Most people believed Singapore was like a fort that the Japanese would never take. 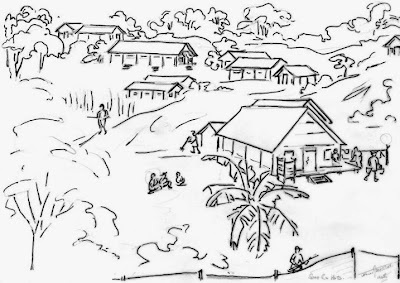 Defences were aimed at the sea in the south, but the Japanese took an unexpected route: overland, through the dense jungles of Malaysia in the north. 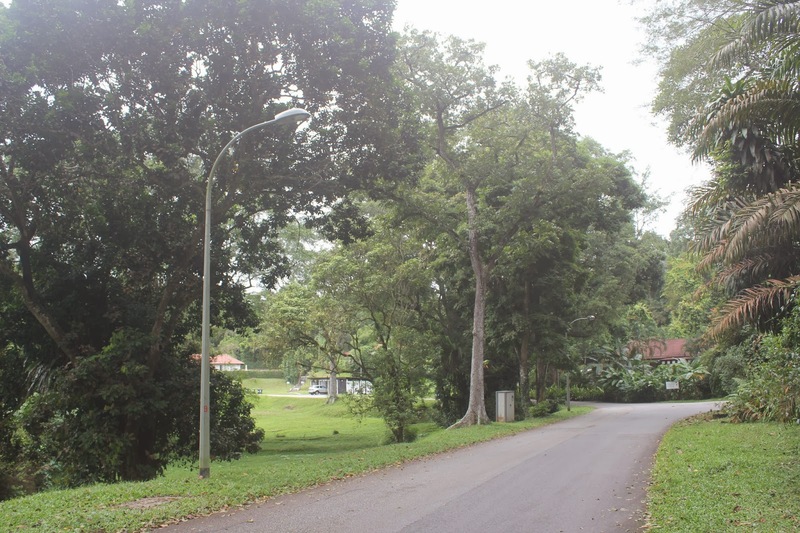 Before the Japanese invasion, the British Army and Royal Air Force decided they needed to centralise their control, and they started to build new headquarters on Sime Road. The road that I can see behind our back garden, from the very desk I am typing on. They also started building new houses to house the military. But the Japanese arrived before these were finished, and only concrete platforms and drains had been realised. General Percival and his staff had to abandon their new headquarters, and retreat to Fort Canning. Initially, like I had rightly heard, both western Prisoners or War and civilians were interned in Changi Prison, on the East coast of Singapore. The Japanese took up their headquarters on Sime Road, in the same ‘Green House’ on the hill, the outbuildings of which can be seen from the back of our garden. 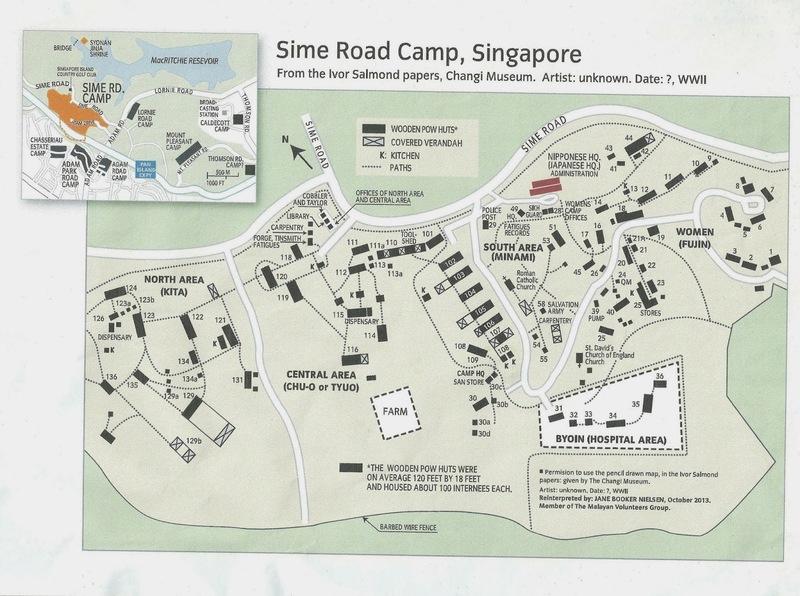 Later, both British and Australian Prisoners of War were moved to Sime Road. They were set to work in McRitchie reservoir, building a Shinto Shrine commemorating Japanese casualties during the campaign. They were housed in huts they built from wood and attap, on the concrete platforms the British had build. Later again, these prisoners were sent to Siam and Burma, to work on the railroad. 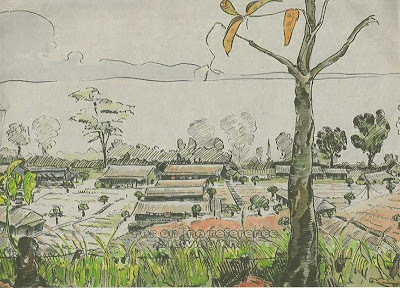 In the last years of the war, Changi prison became full to the brim. 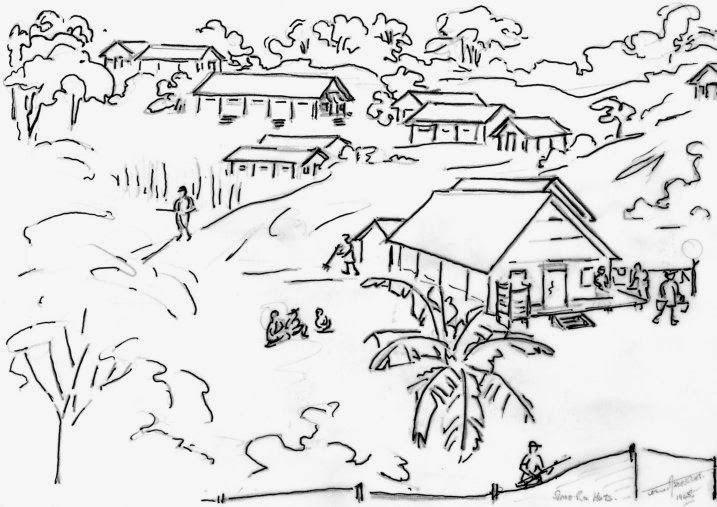 Now civilian internees were moved to the fresh air and greens hills of Sime Road. More wooden huts were built, on the existing platforms and around. It was a large camp, part of it now covered by the motorway. Only one area remained intact, where after the war new, stone houses were built on the platforms, again for the military. This is the area we now call Adam Drive. It is one of these houses in which we now live. And what had this area been in the Sime Road camp? The women’s camp! So my dream had not been that far from the truth. Maybe not in my current stone house, but in a wooden one on the same spot I was laying, white women like myself had been interned during the war. From the map Jon gave me, a copy of which you can see below, it seems likely our house is in the place of hut number 10. 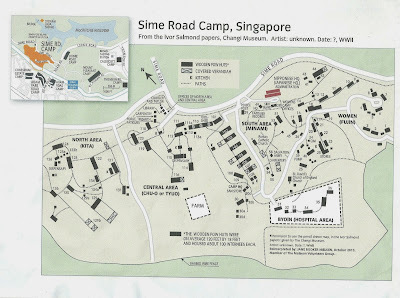 At the end of the war, the Sime Road camp housed over four thousand people, including around a thousand women and a couple of hundred children, and was like a town in itself. There was a hospital, a farm area, church, carpentry, school, and even a pub called the Flying Dutchman. 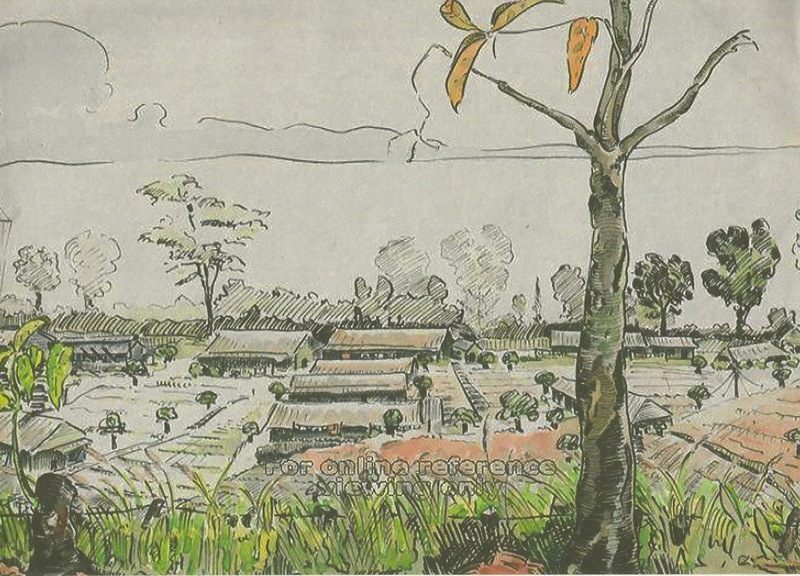 To find out more about life in the camp, I read the ‘Diary of a girl in Changi’, by Sheila Allen, who stayed in both Changi Prison and Sime Road camp. Having read much about the life in Japanese camps in Indonesia, I am impressed at the relatively good circumstances in these camps. There was electricity, and hot running water. The women busy themselves with organising concerts, school, Christmas parties, and other activities to keep them busy. They are separated from they husbands by barbed wire, but still, babies are born, showing some contact must have been possible. 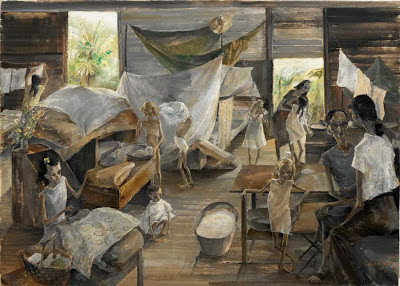 Still, life was extremely hard and uncertain, food rations were very low, and many people died of malnutrition and disease. When we now walk around Adam Drive we see it with different eyes. Our mind will erase the trees, which look century-old, but of which we now know they are much younger, as the area was open and grassy then. Everywhere we try to recognise camp pictures and settings of stories. We mentally erase stone houses and plant wooden huts in their place. We picture the farm at the spot where my kids like to play on the swings. We search for entrances to the mysterious tunnels. We plot the image of the Flying Dutchman pub over the carport that is now in it’s place. The work of Jon and his team is on going, and they have found some new researchers in us. Who knows, what we will unravel?